Payments are made annually in advance. Prices are based on a minimum of 40 users. 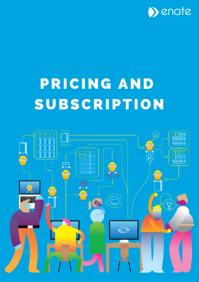 Subscription price is for Software as a Service (SaaS). For more information about pricing, get in touch. Typically, around 10% of the user population need access to Enate Dashboarding. Payments are made annually in advance. For users who raise and manage Tickets and Cases through Self-Service. Enate's Proof of Value (EPoV) process helps our future customers understand how Enate will fit into their business and what benefits to expect. Find out more by viewing our infographic.